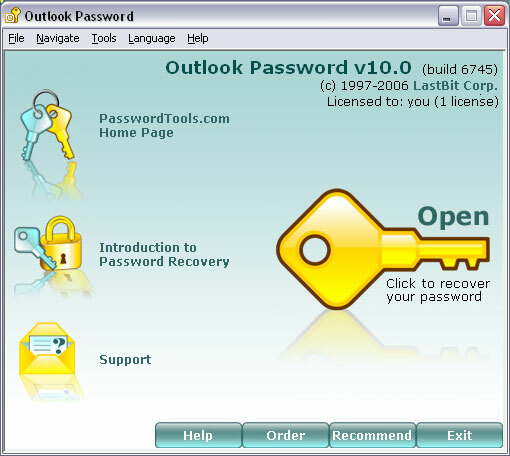 OutlookPassword is able to recover password-protected Outlook personal folders (.pst files). Genuine recovery engine is capable of recovering any password instantly. However there is no way to decrypt the original password. Actually OutlookPassword will construct a "fake" password (something like q!x#$M) which is accepted by Outlook as valid one. Please note that this problem is of global nature, it's absolutely impossible to recover your original password if it is longer than 4 characters. 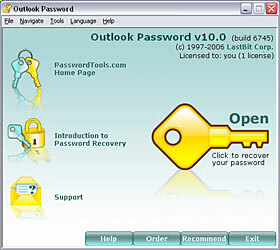 Current version supports all Outlook versions (excepting for Outlook 2003 Best Encryption mode, other modes including default one are supported). Support for Outlook 2003 Best Encryption mode will be added in the next version. Please note that Outlook Password is designed to recover lost or forgotten passwords to personal folders (.pst files) only. It does not crack mail account passwords. To recover mail account passwords you should use our Secret Explorer or Mail Password. Both these programs will work if only the password you want to recover is stored in your system.